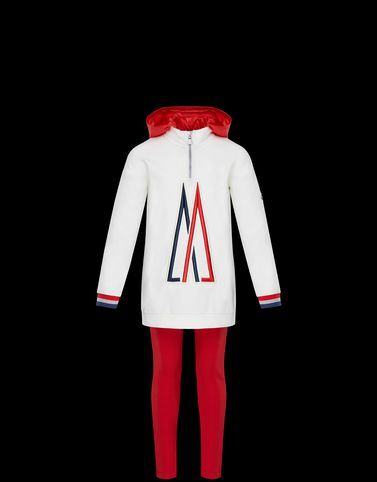 Comfortable, pretty and neat: this is how young girls feel who wear Moncler. This hooded sweatshirt and trousers set is the epitome of practicality with the attention to style that has always distinguished the brand. PART A: Hand wash; Do not bleach; Do not tumble dry; Ironing maximum temperature 110°C - without steam; Do not dry clean; Do not professionally wet clean; Dry flat; Wash separately; Do not twist or wring; do not soak; Remove detachable accessories before washing;PART B: Wash max 30°C; Do not bleach; Do not tumble dry; Ironing maximum temperature 110°C - without steam; Do not dry clean; Professional wet cleaning; Dry flat; Wash separately; It is advisable to wash and iron the garment on reverse.